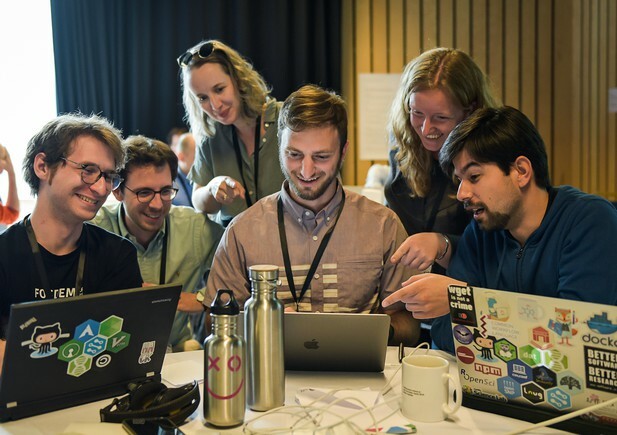 On May 10 and 11, Biomakespace co-hosted the eLife Innovation Sprint 2018 as community partners of eLife. 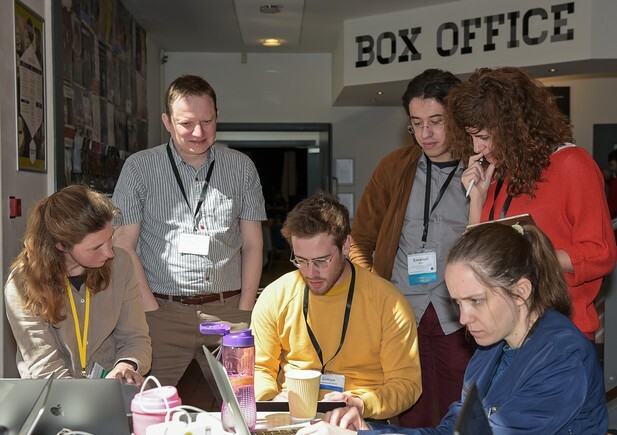 This was a two-day gathering of 62 researchers, designers, developers, technologists, science communicators and more, with the goal of developing prototypes of innovations that bring cutting-edge technology to open research communication. 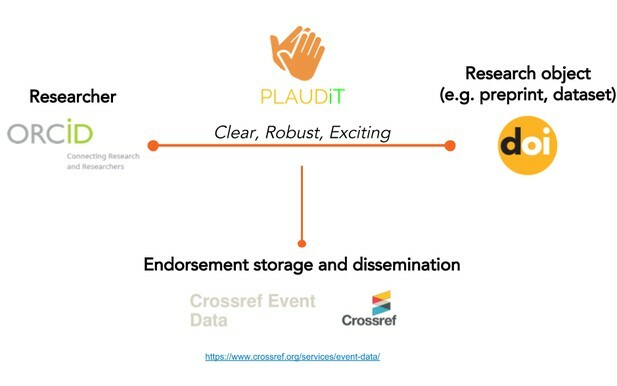 Together, the participants worked on 13 projects, from plug-ins and web-based tools to make researchers’ lives easier, to designing conceptual shifts in the way we share, review and endorse research. We summarise these projects below, and invite your comments and contributions to each. The code for this project is available at https://gitlab.com/Flockademic/plaudit (previouslyhttps://github.com/Vinnl/jic-jac). The code for this work is available at https://github.com/minrk/jupyter-dar/. Since the Sprint, the duo have continued to work on providing compatibility for Stencila within Jupyter servers – see https://github.com/minrk/nbstencilaproxy – such that a Stencila document can now be shared as a Binder project. Try a working example at https://mybinder.org/v2/gh/minrk/nbstencilaproxy/master?urlpath=stencila or watch the demo below. The code is available at https://github.com/dat-land/project-trackbook and continues to be developed. The Project Trackbook team at work. From left to right: Ruben Paz, Vilim Štih, Danielle Robinson, Joe Hand, Kirstie Whitaker, Bruno Vieira. Orquidea Real Photobook – Julieta Sarmiento Photography. Source: Flickr. 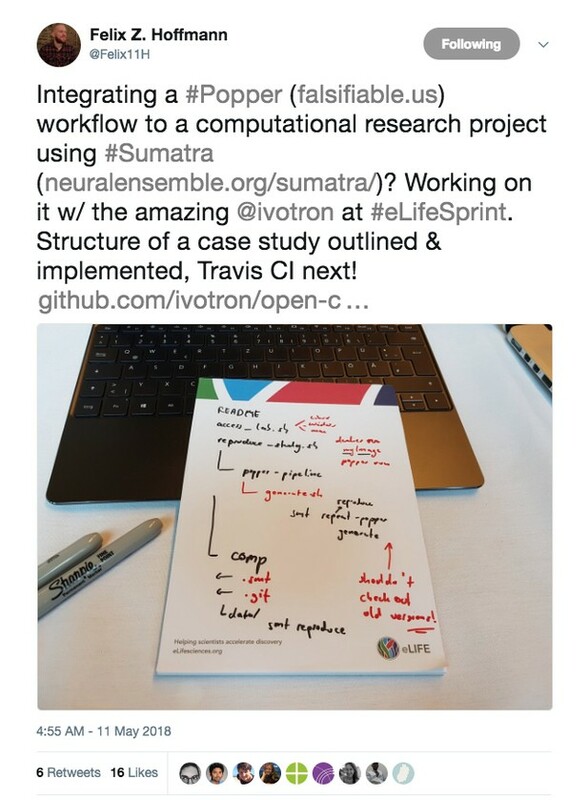 The outputs from the eLife Sprint, notably the design capital and the code behind a prototype platform, are available online at https://github.com/PREreview. 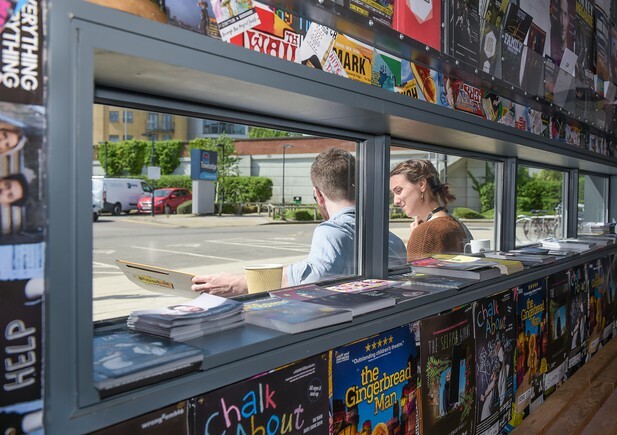 Meanwhile, the PREreview team are working to build resources and capacity to enable ongoing growth and development of the project. 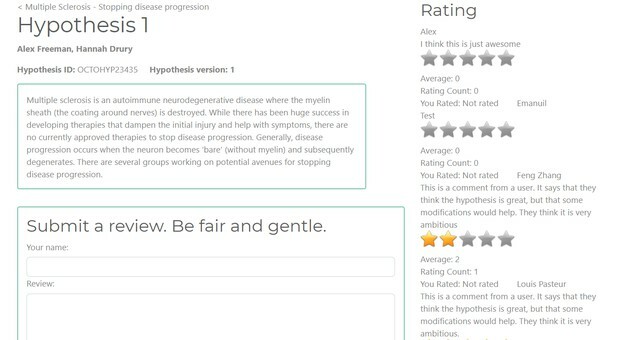 Led by Anisha Keshavan, and building on her previous work to encourage community contributions to science (see Braindr), the Appstract team built “a mobile-friendly tapping game that allows players to annotate sample sizes from scientific abstracts”. Curating these data could enable researchers to identify and filter biomedical literature based on sample size, which is an important factor when assessing the validity of a claim or result. It also provides data for metascience researchers interested in sample sizes, for example investigating change in sample size over time, and the data could be used to train a machine learning algorithm to extract these data automatically in the future. The team are continuing to develop the tool, and encourage others to play online at https://appstract.pub/. The code is available at https://github.com/akeshavan/appstract. 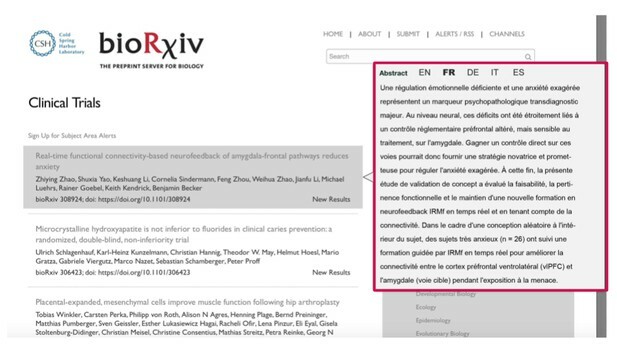 Appstract uses natural language processing (NLP) to identify numerical data and text within scientific abstracts. These elements are highlighted and the user taps to identify those that contribute to the study’s sample size. 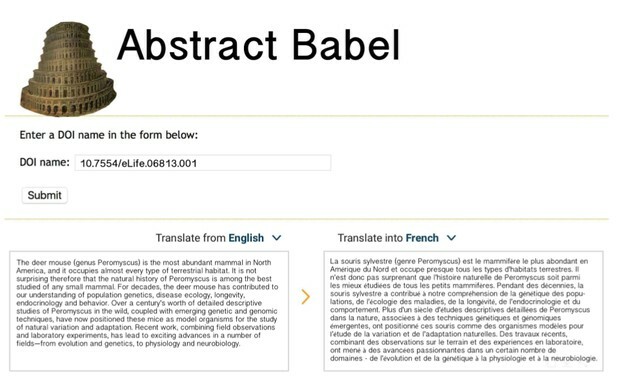 A working demo can be found at http://54.171.113.39:8080/?doi=10.7554%2FeLife.34348 (just click 'Translate') and the code is available at https://github.com/nlisgo/abstract-babel. “Open annotations. The current annotation count on this page is 0. Items such as articles and books are cited in Wikipedia articles. 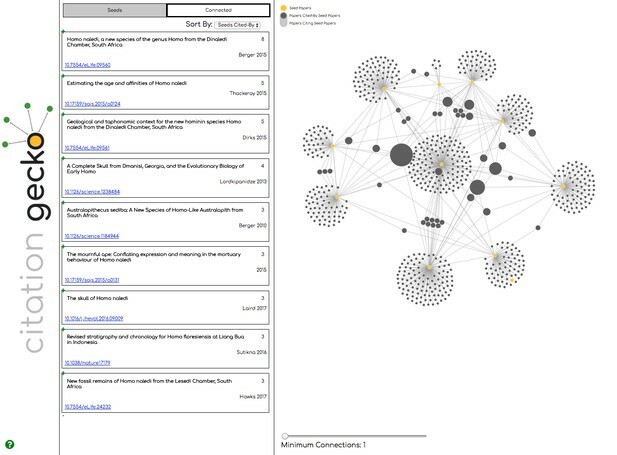 Wikipedia has the data that captures all these citations (available at doi.org/10.6084/m9.figshare.1299540.v10), which this team used to prototype a search and visualisation tool for browsing Wikipedia citations. By the end of the Sprint, the team managed to build a working back end and front end, and now they plan to integrate these to deliver a working demo of a web-based tool for others to try. The code is available at https://github.com/Samwalton9/WikiCiteVis. Of note, Ross Mounce, Open Access Grants Manager, Arcadia Fund, also worked on the Wikipedia citations dataset at the Sprint and identified the most-cited items across all Wikipedia pages. His work was mentioned in a recent Nature News & Comment article and is openly available at https://github.com/rossmounce/DOIs-in-Wikipedias. Ivo Jimenez, PhD candidate, University of California, Santa Cruz, and Felix Z. Hoffmann, PhD Student, Frankfurt Institute for Advanced Studies, are both interested in reproducible research. Ivo is part of the team developing Popper, a convention that “allows researchers to automate the re-execution and validation of experimentation (computational and analysis) pipelines”, while Felix has previously contributed to Sumatra, a tool that automatically tracks and documents computational research. 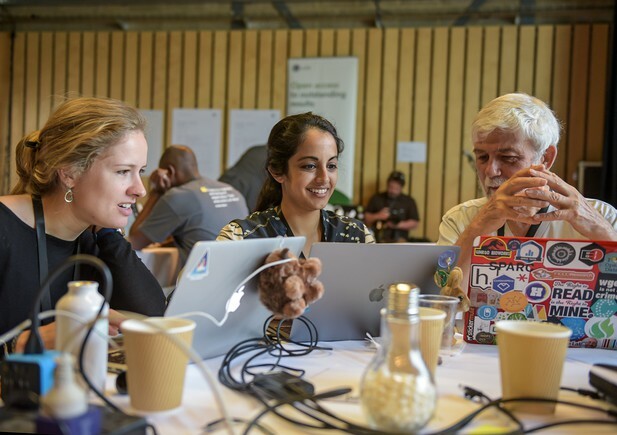 Together, this duo created an example project to demonstrate how to share computational research openly and reproducibly using both Popper and Sumatra. Real-life examples of reproducible research are important for testing, validating and refining tools. 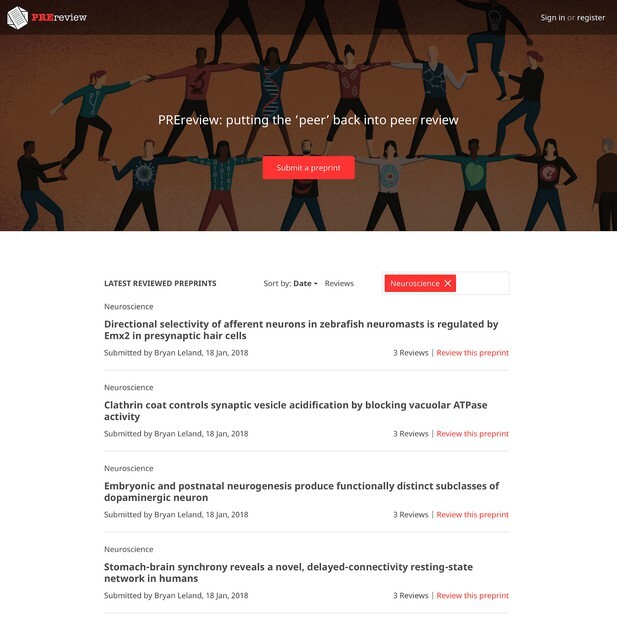 The case study can be found online at https://github.com/popperized/open-comp-rsc-popper. The largest project group tackled an equally large problem: “what would we want science to look like if we started again?” From this, they prototyped Octopus, “a system that breaks the traditional paper format into its component pieces, vertically and horizontally linked [with] commenting, flagging and rating as a replacement for peer review [and] automatic language translation, and all saving to a distributed database”. Follow the project at https://octopus-hypothesis.netlify.com/ and explore more documentation at https://github.com/octopus-hypothesis/Octopus-docs. The code for the prototype tool is available at https://github.com/octopus-hypothesis/octopus. The team plan to continue developing their ideas and designs into a testable prototype research communication platform. When using literature management tools, researchers can highlight and annotate the texts in their library. These annotations and highlights provide a rich source of knowledge and information for subsequent work, and can be interrogated with proprietary tools. Unable to find a free and open source (FOSS) tool that allows a user to run quantitative text analyses on these annotations and highlights, Asura Enkhbayar, Data Scientist/PhD Student, Simon Fraser University, was motivated to build one. 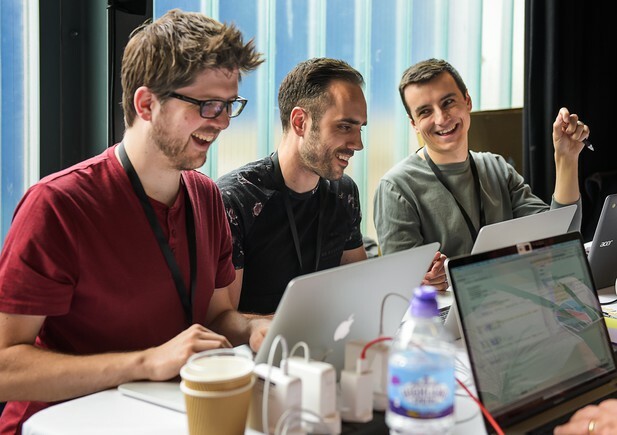 Together with Achintya Rao, Doctoral Student (UWE Bristol) and Science Communicator (CERN), and Rik Smith-Unna, Scientist and Software Developer, ScienceFair, this team ultimately found an existing open source tool that works on Zotero collections and worked to improve on it. Their work is available online at https://github.com/Bubblbu/zotero-insights. Next, they aim to finalise the Zotero plug-in and to create a template notebook (or ‘cookbook’) for others to use for their own quantitative text analyses. 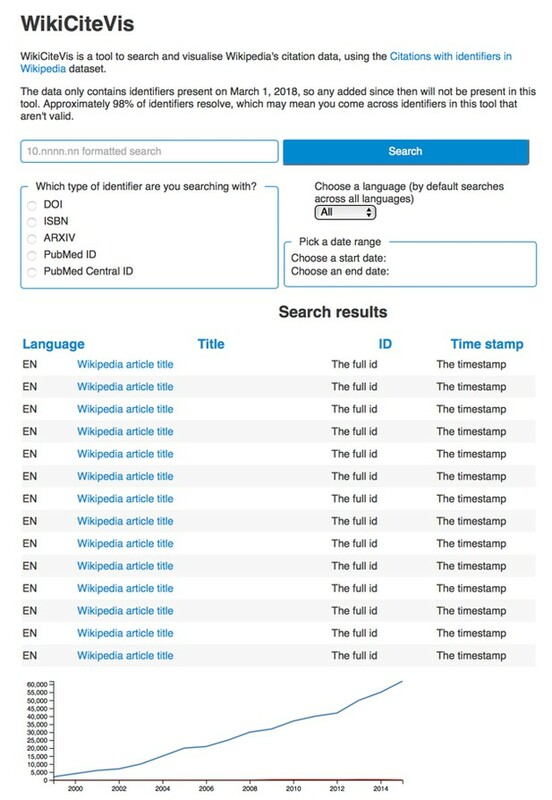 Try Citation Gecko at http://citationgecko.com; the code is available at https://github.com/bjw49/citation-network-explorer. 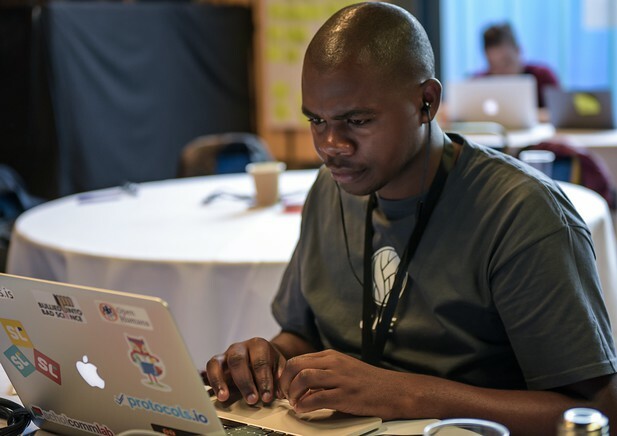 Project lead Oarabile Mudongo seeks to bring web literacy and access to knowledge to marginalised communities, specifically townships in Cape Town, South Africa. To bridge the digital divide, Oarabile has initiated a project to engage, educate and empower next-generation leaders to create lasting change in their own community. Initially named #Rethink Web Literacy, the project was rebranded at the eLife Sprint as Funda (which is Zulu for “to learn”). Oarabile worked with Nick Duffield, UX designer, eLife, to design a logo, and with Joe McArthur, Assistant Director of the Right to Research Coalition, SPARC, to consider community building around the initiative. Oarabile plans to continue developing the projectwith the aim of sharing it with the broader digital inclusion community at MozFest, Mozilla’s annual festival, in October. The project canvas is available online. One barrier to reproducibility in science is the lack of clarity on the lab reagents used in an experiment. Currently, the system relies on written methods without a formalised or machine-readable structure. 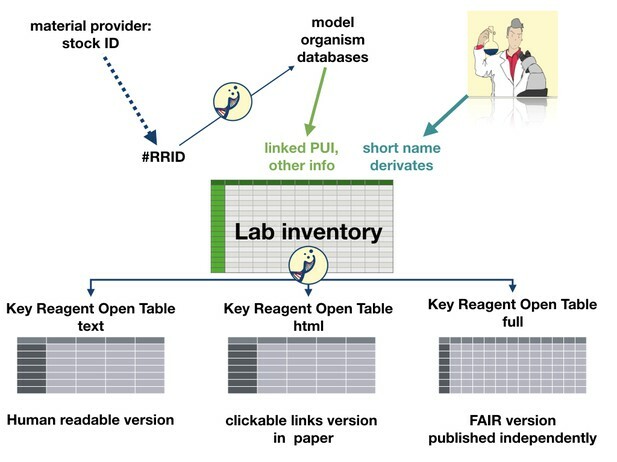 Led by Julien Colomb, Reagents.io is a project to create standards that describe and report lab reagents, and create an application to merge different standards into one unique format. 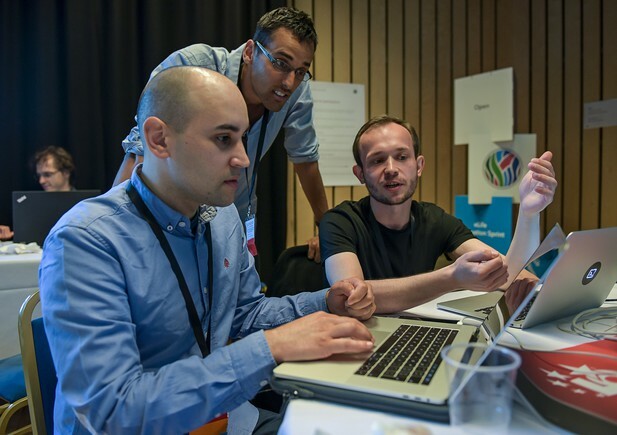 At the Sprint, Julien worked with Melissa Harrison, Head of Production Operations, eLife, to consider ways to make this information open and accessible. Contribute to the project via https://github.com/jcolomb/reagentsio_website.